In this video we will discuss implementing a search web page using ASP.NET and Stored Procedure. This is continuation to Part 138. Please watch Part 138 from SQL Server Tutorial before proceeding. The search page looks as shown below. Step 1 : Modify the "spSearchEmployees" stored procedure to include NULL as the default value for the parameters. The advantage of specifying default value for the parameters is that the ASP.NET page need not pass those parameters when calling the stored procedures if the user did not specify any values for the corresponding search fields on the Search Page. 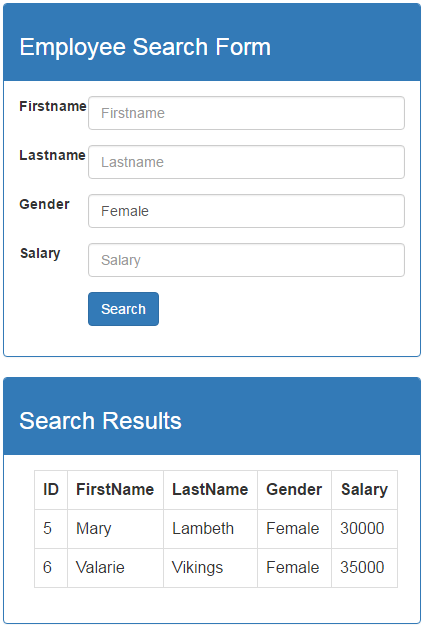 Step 2 : Create a new empty ASP.NET Web Forms application. Name it "DynamicSQLDemo". Step 4 : Add a WebForm to the project. Name it "SearchPageWithoutDynamicSQL.aspx"
Step 5 : Copy and paste the following HTML on the ASPX page. Notice we are using Bootstrap to style the page. If you are new to Bootstrap, please check out our Bootstrap tutorial for beginners playlist. Step 6 : Copy and paste the following code in the code-behind page. Notice we are using the stored procedure "spSearchEmployees". We are not using any dynamic SQL in this example. In our next video, we will discuss implementing the same "Search Page" using dynamic sql and understand the difference between using dynamic sql and stored procedure.